As an Internet Ad Consulting company, we design elite strategies and implement them for our customers, ranging from some of the biggest online sites to some of the smallest, and monetize traffic for each client. Our power is represented with more than a billion impressions a day on 35,980 websites, mainly from North America & Europe. 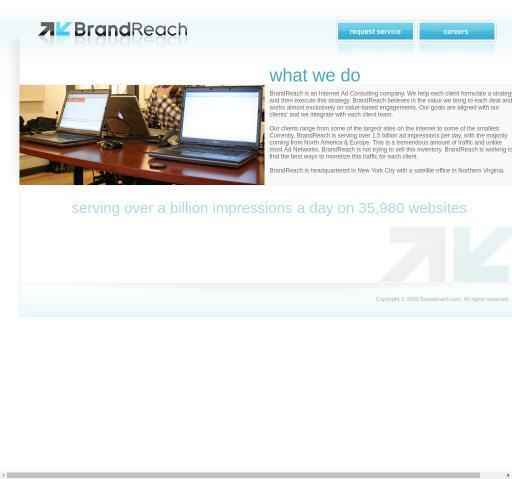 Unlike most Ad Networks, BrandReach does not try to sell this crazy amount of traffic but highlights the value we bring to each client and works almost solely on value-based performance. We regard our clients' goals as ours and we assign staff, analyze those goals of every single client and strive to bring the best for our clients. You can check BrandReach reviews on Affbank and ask BrandReach Team any question by using the contacts above, especially about how to earn money!